Armadillo cake. Ten points if someone can guess the significance of the cake. 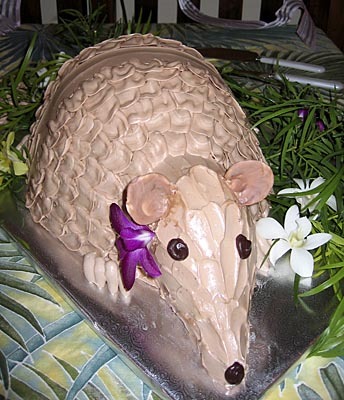 Didn't they have an armadillo cake in Steel Magnolias? Oh- I've got it. They're doing that play at Aloha Theater, the cake is for the performers to celebrate opening night. Winnnah!!! Yup Aloha Performing Arts Steel Magnolias play. The armadillo groom's cake was the dessert for the cast Sunday. I didn't stay to partake of the feast as I left after the first act.